Located 167km northeast of Rio de Janeiro lies Armação dos Buzios more commonly known as Buzios. A wonderfully hilly and wooded peninsula boasting no less than 23 stunning beaches, each with their own distinct characteristic and all with picture perfect turquoise water. Originally, Buzios was a sleepy fishing village that over time became popular with the well healed of Rio de Janeiro as a weekend get-away. However, it was not until the 1960s when Bridget Bardot visited Buzios for the first time with her then Brazilian boyfriend, that Buzios found a place on the international map. Today, Buzios is still a popular holiday destination with Brazilians and it has become hugely popular with the Southern Cone countries – in particular with the Argentineans. They definitely make up the vast majority of tourists in Buzios, so much so that you would think that “Portonhol” (a mix of Spanish and Portuguese) is the official language of the city! So what do I like about Buzios so much? Well, quite honestly – everything! Not only are the beaches and surrounding nature absolutely exquisite, but even the town centre itself seems so well thought out and maintained when compared to the beach towns I mentioned previously. But most of all, I liked the people – both tourists and locals alike. There was an air of sophistication and pride which I have not experienced in other beach towns before. There are no drunk Americans and Canadians on Spring break like in Mexico, no sleazy girly bars and blatant prostitution like you find in Phuket and no demanding overly pushy sales people like you get in Bali. Overall, it just was an extremely pleasant environment. 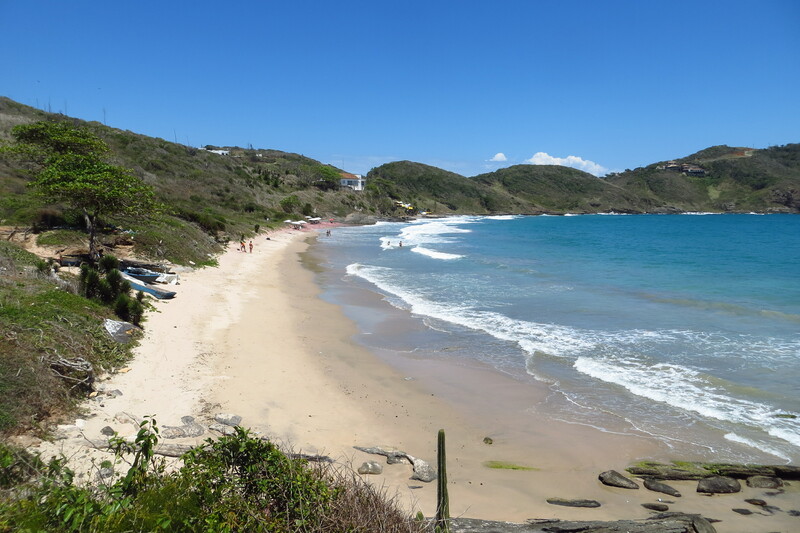 Although I must put in a disclaimer here – we did visit Buzios in low-season. Although it was not sleepy by any stretch of the imagination, I have heard it becomes pretty crowded during high-season (Mid December until after Carnival). We stayed in Buzios for a little under a week – at first I thought it would be too long and that C and I had been overly ambitious with our holiday, but it turned out to be the perfect amount of time. There is plenty to do in Buzios, however C and I really focused all of our energy on just relaxing and being beach rats! We made a point of visiting as many of the 23 beaches as possible and we definitely made a good crack at it. We even made it to the only nudist beach on the peninsula – which was a bit of a hike (obviously for privacy reasons)! Surprisingly this ended up being one of our favourite days! We went as a bit of a dare – the plan was to go, have a swim and leave, just to say we had done it. But we ended up staying pretty much the whole day –the incredibly strong and large passion fruit caiparinhas served by the naked bartender definitely helped with our inhibitions! All in all – it was a fantastic week. If you are looking for a new beach destination, I would highly recommend Buzios. I know that C and I will go back in a heartbeat! < Previous Smokey Bacon Jam!